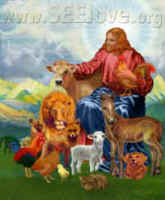 In Part 1 I maintained that the churches’ explicit and implicit endorsement of animal abuse undermines Jesus’ message. Why is this so? Jesus encouraged love, compassion, and peace. These principles are incompatible with victimization, in which the powerful benefit from harming the weak. Asserting that the victims are “just animals,” “don’t have souls,” “lack human intelligence,” etc. are inadequate excuses, because we know that animals can feel pain and suffer, and we know that our faith teaches that God cares about all Creation. Similarly, defending animal abuse on such grounds as humanity’s supposed “dominion” over animals or the assertion that God created animals for humanity’s benefit have poor biblical and theological foundations, and our booklet, Are We Good Stewards of God's Creation counters these self-serving claims. In addition, concern for animals has profound implications for human rights, because victimizing animals opens the door for victimizing humans. The victimization of animals has always been based on animals’ supposed “inferiority.” However, people are not equal either, and these differences have been the criteria, from the beginning of time, for humans to justify victimizing each other. As long as our culture considers victimization a legitimate activity, all weak and vulnerable individuals – human and animal – are at risk. We might tend to avoid victimizing people today (although racism, sexism, homophobia, xenophobia, etc. continue to flourish), but the transition from victimizing animals when convenient to victimizing humans when there is a perceived threat or other “need” is, psychologically, a small step. All that communities need to do is generate contempt for the victims, and history – from Nazi Germany to Bosnia to Rwanda – shows how easy this can be. Tragically, human desires and passions readily trump human reason, and the surest way to avoid the victimization of innocent individuals is to share Jesus’ faith that God is about love, compassion, and mercy, not about worldly vengeance, hate, and death. Indeed, Jesus rejected victimization, and the New Testament is replete with stories of Jesus’ championing those who his society rejected, including members of other tribes, sinners, widows, and those who were infirm. Jesus preached a Gospel of love, and all victimization undermines this Gospel. As a consequence of the institutionalization and mechanization of animal abuse, the United States today abuses more animals than any other nation at any other time in human history. Meanwhile, the horror of factory farming has become a worldwide phenomenon. As long as Christianity countenances abuse of innocent individuals, it is a stain on the world and a betrayal of Jesus. Our vegetarian calling is not only a calling to save animals, nor only an effort to heal a broken and deteriorating world; it is a calling to save Christianity itself.